What is success without failure? And what is a beautiful life without its ugly things like sadness, broken hearts, and obstacles. All we have to do is, not go through life, but grow through it! So let us do it with a smile on our face, because in the end, everything will be just fine. We don’t choose we embrace. That some love to hear. To test out the bold”! To get right back up! 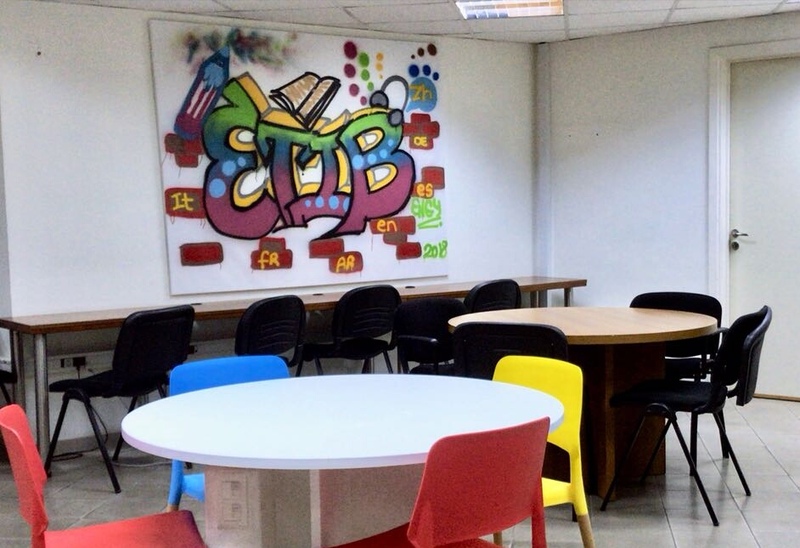 Dans le cadre de la rénovation de l’espace d’étude de l’École de Traducteurs et d’Interprètes de Beyrouth (ETIB), j’ai décidé d’investir mon talent en graffiti non seulement pour redonner un coup de neuf aux murs de la faculté mais aussi pour redorer l’image de cet art. Fleurissant incroyablement le long des ruelles de Mar Mkhayel, s’épanouissant sur les autoroutes de Dbayeh et ornant les passages beyrouthins, l’art du graffiti ne passe certainement plus inaperçu de nos jours. Des murs autrefois dépourvus d’intérêt, un triste bâtiment qui sort de la guerre et un chantier démembré sont les patients de cette thérapie émergente. Elle les ravive, les orne d’optimisme et d’espoir. Etant l’un de ces patients désenchantés, l’espace d’étude de l’ETIB m’a été confié et j’avais carte blanche pour la thérapie de ses façades. J’ai ainsi contribué à la législation d’une activité a priori considérée comme vandalisme mais qui se révèle être en réalité comme un moyen d’embellissement. Identique à la traduction, le graffiti est un moyen qui transmet un message. À travers mon dessin, j’ai voulu montrer aux étudiants que chaque personne peut marquer un lieu de son empreinte. Ainsi, je laisse une trace vivante non seulement de mon appartenance à l’ETIB mais aussi de celle d’une promotion dynamique et inoubliable. Have you ever went through your life from one insignificant event to the next, and eventually found out they were all parts of a much bigger plan and each of them happened for a reason? Many people do not believe in coincidences. I personally am torn. I do believe there are some wonderful coincidences that shape our lives in ways we may never expect. However, the other half of the time, I believe that everything happens for a reason. And it can seem like a major contradiction but both thoughts are equally as powerful. I’d even go to the extreme and say that every second might make a major change in our lives. How many things have happened to us, how many people did we run into or how many bad events were we spared from, just by being late for something or leaving earlier, or doing something, just anything, without knowing this was going to change the course of our lives? Let me paint you a little picture. One day she was 15, she was posing in front of the Buckingham palace with her friend. Twenty two years later, Meghan Markle married the prince and the palace was no more just a background in a picture; it became home. I am not saying a picture played a part in the course of the events but it is only after everything has happened, that we look back and say « who knew we would go from this to where we are now ». A woman even happened to see her fiancé in a picture of her family at ten years old, when she went from the UK to Montenegro, and he happened to be in the background, visiting the same beach at the exact same time, while both were from different countries (check out their story here). It is both funny and strange to think that maybe even changing your plans for lunch can lead to a stranger becoming irreplaceable down the road, to landing a major work opportunity or even escaping a certain misfortune. It really is amazing to look back on certain things only to realize everything in your life, every delay, every little change you make to your day or even not making any change at all can be life changing. Perhaps it is a butterfly effect that makes every small decision matter and makes us all connected on some level. Whether you believe in this or not, next time you feel things are not going as planned, stop and realize that they might just be falling into place. يحدث أحيانًا أن نتعلّق بالأشياء لا بالأشخاص؛ كتلك الوردة التي تلقّيناها مِمّن نحب وخبّأناها في الكتاب لتَيْبس، أو كذلك الزّي المدرسي الذي يُحيي ذكريات المقاعد الدّراسية في أرواحنا فينعشها، أو كهذا الدّفتر الذي يضمّ تعليقاتٍ بريئةً وطريفة تركها لنا أصدقاء الطّفولة لتبلسم حنيننا إلى الماضي. ويحدث أحيانًا أن يكون هذا الشيء مجرّد هاتف. لا أحبّ تغيير هاتفي بشكلٍ دائم. ربّما هي العادة، أو فكرة تبديل الهاتف مع كل إصدارٍ جديدٍ لا تستهويني. عندما ابتعت هاتفي الأبيض والفضّي منذ أربع سنواتٍ، كان أكثر من جهاز تواصلٍ بالنّسبة لي. كان ذاكرتي النّقالة التي وثّقت أهم مراحل تلك الفترة من حياتي. رافقني في مشواري الأوّل إلى إسبانيا فخلّد تلك التّجربة بأدقّ تفاصيلها، حتّى حين يغافلني النّسيان، تعود الصّور المؤرشفة في هاتفي لتذكّرني بها. وإكرامًا لوفائه الدّائم، اصطحبته معي في رحلتي العائلية إلى روما. فأتى ردّه بأن وثّق كل لحظةٍ بلحظة واختزل رحلتي الإيطالية بمجموعةٍ من اللّقطات، وكأنّ المقصود بها طمأنتي بأنّ هذه اللّحظات ستبقى حيةً مدى العمر. لم يكتفِ بهذه المناسبات فحسب، بل كانت له إطلالته الخاصّة يوم تخرّجي. التقط لحظة استلامي الشهادة الجامعية، وفرحة أمي بتخرّج ابنتها، وحماسَة أبي وتصفيقه، وبراءة أختي الصّغرى وابتساماتها واحتفالي الصّاخب مع أصدقائي. حتّى أنني كنت أحتفظ برسائلي النّصية كلّها، المهمّة منها وغير المهمّة. أعيد قراءتها بين الحين والآخر فأسترجع تلك الرّسائل التي تضمدّ جرح الاشتياق لأشخاصٍ انقطع الحديث معهم وتستحضر بعض المواقف الطّريفة والكلمات الطّيبة التي دائمًا ما تخلّف وراءها ابتسامةً خجولة ترتسم على شفتَيّ ولو لثوانٍ. كُنت أجلس على الأرض الخشبية للشاطئ وصوت خرير المياه من تحتي يُضفي لمسته الخاصّة على الأجواء الصّيفية الحارّة بامتياز العام الماضي، الهاتف بجانبي. لم أكد ألمسه حتّى انزلق بين فتحات الأرض الضّيقة ووقع في البحر. خيّم الصّمت للحظةٍ ولم أستوعب ما حدث. فضِلْتُ أسترجع الصّوت الذي أصدره سقوط الهاتف في المياه تأكيدًا على أنّني فعلًا فقدته. فقدت ذاكرتي. فقدت ذكرياتي، تجاربي. كأنّ رحلتي إلى إسبانيا لم تحدث يومًا. كأنّ تخرّجي ليس إلّا من نسج الخيال. كأنّ الرّسائل لم تُكتب والمحادثات لم تحصل. لم أكُن أعلم أن الهاتف يستحوذ على هذه المساحة المهمّة من حياتي. لم أكن أعلم أنّني متعلّقةٌ بجهازٍ احتفظت من خلاله بمرحلةٍ مهمّةٍ من عمري بدلًا من أن أطبعها في ذاكرتي البشرية. لو لم أفقد هاتفي « غرقًا » لما كنت شعرت بهذا الأثر الكبير الذي تتركه الهواتف في حياتنا، والأهم، لما كنت اتّخذت قرار عدم توثيق أيّ شيءِ على هاتفي بعد اليوم تحسّبًا لأيّ حادثٍ مماثلٍ في المستقبل. “I get bored while working out”. “I am busy, I do not have time”. “I hate going to the gym”. “I can’t stop binging on fast food”. How many of us have said that in the past week? Let us face it: people come in different shapes and sizes; some are thin, some are chubby and others are overweight. However, no one is ever satisfied. Well, guess what? It is never too late to join the fit/healthy club. I, personally, was a thin lazy person who never thought of hitting the gym. I was not satisfied with my body; however, I never felt the urge to exercise or to cut down on junk food. Months passed by and I realized that I can actually create a new lifestyle that will help me be an active person as well as maintain good health on the long run. So, I gave it a try. Fortunately, exercising has now become an indispensable daily routine of mine. Other than the benefit of maintain a nice silhouette, it helps me vent out and pushes me to put aside all the life-related stress that weighs on my shoulders. In fact, as soon as I finish my workout and leave the gym, I feel fresh and alive! The feeling is indescribable. As for eating healthy, it is a mindset that will later turn into a lifestyle. All you have to do is set your mind to it and, voilà! You are ready to go! Love it. Respect it. Cherish it. And most importantly, never be ashamed of your body, for it is what boosts your confidence and gives you self-satisfaction. It might be hard to commit at first; however, I assure you that it will be a very rewarding journey once you reach the finish line. After all, as they say, “NO PAIN, NO GAIN”.